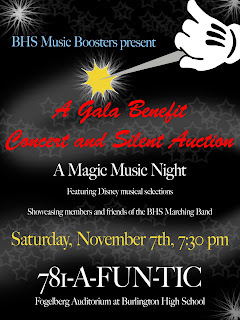 The Burlington High School Music Boosters Association is pleased to sponsor its second annual GALA BENEFIT CONCERT AND SILENT AUCTION on November 7, 2009, at 7:30 pm in the Fogelberg Auditorium of Burlington High School. This concert is a fundraiser for our Marching Band students to raise money for their trip to perform at Disney World in April of 2010! The evening will showcase the music of Disney with performances by Burlington music teachers, friends of the Marching Band, and will highlight the BHS Marching Band, Color Guard and Dance Squad in independent performances! Intermission will offer a time to bid on our wonderful Silent Auction items while enjoying the tempting array of pastries from local bakeries and coffee shops at our dessert reception! Our Silent Auction highlights include New England Patriots tickets, a relaxing cabin weekend get-away on Balch Lake in Wakefield, New Hampshire, opening night tickets to the Reagle Players annual holiday extravaganza, It's ChristmasTime, and loads of other spectacular restaurant and pampering surprises! This is a family friendly event so bring your kids and grandkids and enjoy a wonderful night of music and merriment! General admission tickets are $10 for students and senior citizens and $15 for adults. Tickets can be purchased from music students (sale will credit their Disney account), by phone at 781-A-FUN-TIC or at the door. PS: Please feel free to print out the attached flyer and post in your office and pass this email on to someone who may also like to attend!